You’ve probably noticed for quite some time that celiac disease among clients and patients is on the rise. In fact, there’s been a four- to fivefold increase in the prevalence of celiac disease in the past 50 years, according to a study published in the July 2009 issue of Gastroenterology. Currently, approximately 1% of the US population, or 3 million people, has celiac disease. And the number of people with gluten sensitivity also is increasing. The good news is that there’s a wide variety of foods clients with celiac disease and gluten sensitivity can eat. Aside from fruits, vegetables, lean meats, fish, seafood, legumes, and the delicious recipes that call for these ingredients, supermarket shelves are lined with gluten-free cereals (both hot and cold), breads, bagels, muffins, snack bars, pizza crusts, baking flours, soups, sauces, gravies, condiments, pastas, alternative grains, and many other items for consumers to enjoy. All these foods provide the necessary nutrients that many clients and patients with celiac disease and gluten sensitivity need for intestinal healing and symptom relief, such as iron, folate, calcium, magnesium, phosphorus, and vitamins B12, D, E, and K. Even so, many find it difficult to get enough fiber in their diet after removing wheat-based cereals, breads, and other products, and we all know how important dietary fiber is for digestive health, weight management, and cancer prevention. 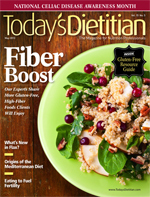 In our cover story, “Fiber Boost,” dietitians discuss the reasons fiber intake decreases among clients and patients with celiac disease and gluten sensitivity, and provide creative strategies to increase their intake. We offer a list of gluten-free, high-fiber snacks and other products to share with clients as well as recipes. Also in this issue is our annual Gluten-Free Resource Guide, featuring a variety of healthful products. We’re also featuring an excerpt from the book Eating Expectantly by Bridget Swinney, MS, RD, LD, in the article “Eating to Fuel Fertility.” The fourth edition, coming out this month, is written for clients and patients who want to improve fertility, pregnancy outcomes, and increase the odds of having a healthy baby. You’ll want to use the excerpt as a patient education resource during counseling sessions. Tell us what you think about these articles on our Facebook and Twitter pages. And please enjoy the rest of the issue!